Liz and her husband have enjoyed visiting Portugal on many occasions. On their travels, they especially like sampling local food and drink. So, you've decided on a destination. In our case this was Porto. You've decided how best to get there and researched the cheapest fares. You've chosen and booked some reasonably priced accommodation. Job done? Not quite. There's the small problem of what you are going to eat and drink while you're away. For us this can be a bit of a 'hit or miss' approach. We tend to hit the ground running (or maybe walking at a leisurely pace is more exact) and figure the food and drink issue out once we're there. This article aims to help others learn a little from our experience. An early flight from the UK got us into Porto mid-morning on a Sunday and, after a very early breakfast, it wasn't long before we needed some lunch. Unfamiliar with the local area, we asked the advice of the reception staff at Holiday Inn Express Exponor. 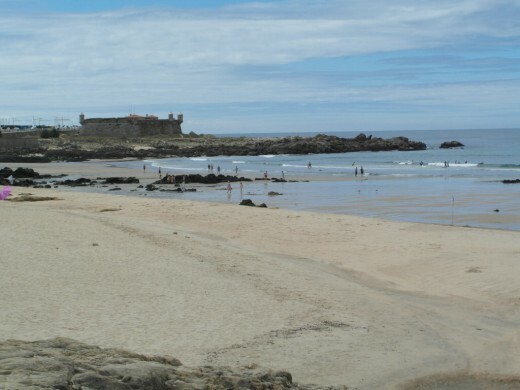 Due to its location near the Atlantic coast, seafood is in plentiful supply in Porto and the surrounding area and hotel staff were quick to recommend seafood restaurants in Matosinhos, near the fish market. The setting on an ordinary street behind the port was nothing special. But on a Sunday lunchtime, the restaurants on Rua Herois de Franca were very popular with locals and tourists alike. Chefs were kept busy at barbecues set up on the street, cooking fresh fish to order. We decided on Restaurante O Antonio and ordered sardines and carp at 6.50 euros each. Potatoes were 2.50 euros and a bottle of water cost us 2.25 euros. The language was an issue, as our Portuguese is limited, as was the waiter's command of English. Tip: when dining a little off the tourist track, you need your wits about you. The waiter was very attentive in restocking our potatoes and offering more fish, which was fine until we got the bill itemizing each extra portion. Three portions of potatoes worked out at 7.50 euros. The fish was good, but we prefer to have a little more control over the bill. The next day, having recovered from our early flight and fortified by an all-you-can-eat Holiday Inn Express breakfast, we set off to explore the city of Porto. 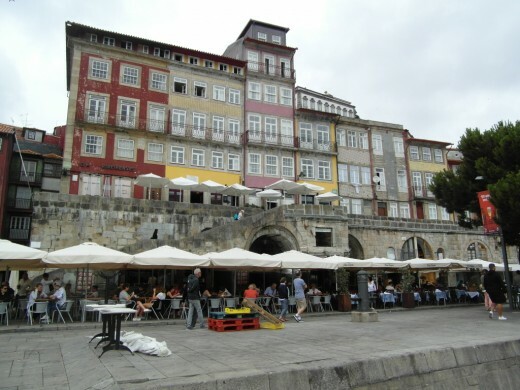 After visiting some of the tourist sites up the hill, our exploration took us down to Cais da Ribeira, on the north bank of the River, where I wondered if we were going to have to push the food budget a little, as the plentiful eating places were not cheap. 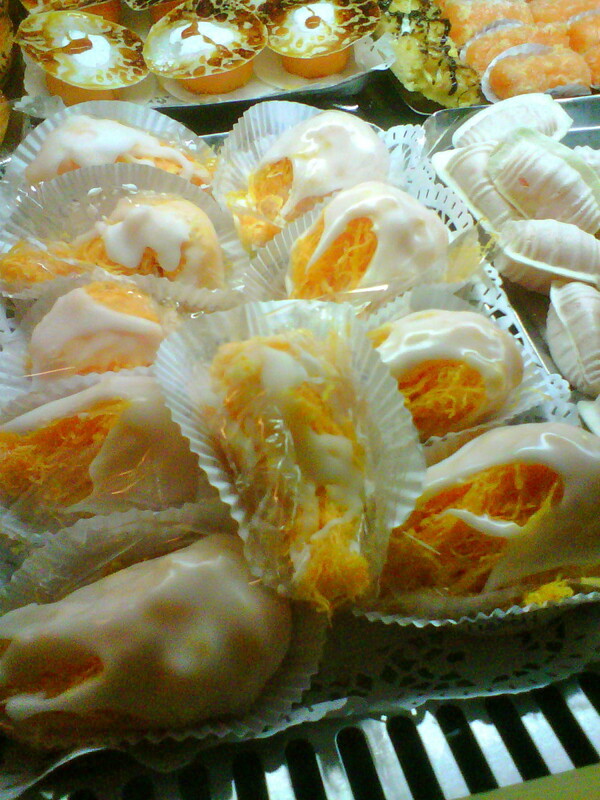 But a walk over the Ponte de Dom Luis 1 restored my belief that Portugal offers some of the best value meals in Europe. Walking west along the River Douro, we came upon Restaurante Beira Rio, Av. 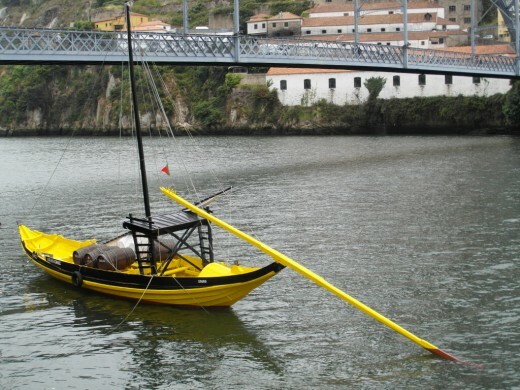 Diogo Leite, 64, Vila Nova de Gaia 4400-111. The menu touristico (tourist menu) was reasonable at 15 euros for a starter, main course, sweet and a bottle of wine. 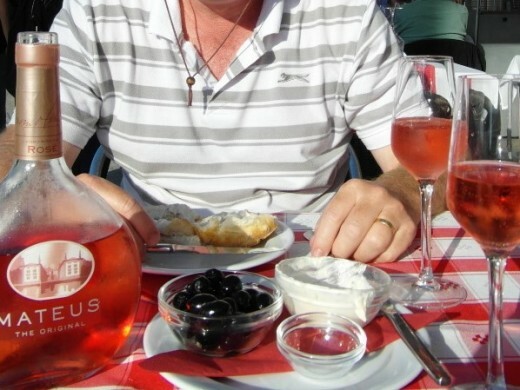 We went there several times during our time in Porto and were soon being given Mateus Rose, a very nice Portuguese rose wine, instead of the house wine and by the end a glass of port as well, at no extra cost. Sardines (pictured below) featured on the tourist menu. If you are happy to pay a little more for your food, the a la carte menu gets good reviews, especially for the seafood. We also tried Restaurante Rabelos nearby at Av Diego Leite, 68, Vila Nova de Gaia 4400-111. The tourist menu here was 25 euros for two people, but then drinks had to be added to this. We only made one visit here, as it didn’t seem as good value as Beira Rio, our favorite. Both restaurants offered the option of dining outside with views back across to Porto on the opposite bank and towards Ponte Dom Luis 1. 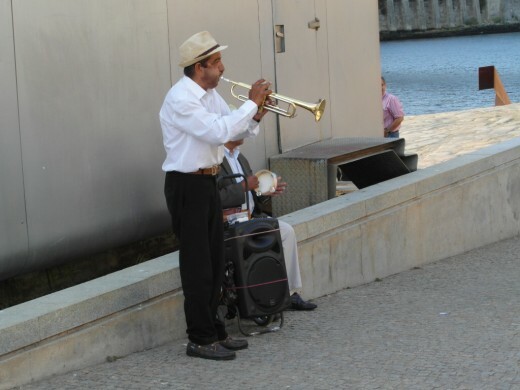 There was also entertainment provided by roving musicians. If you’re looking for a real bargain meal and are prepared to forego the riverside setting for the top floor of a high-rise department store, El Corte Ingles might fit the bill. 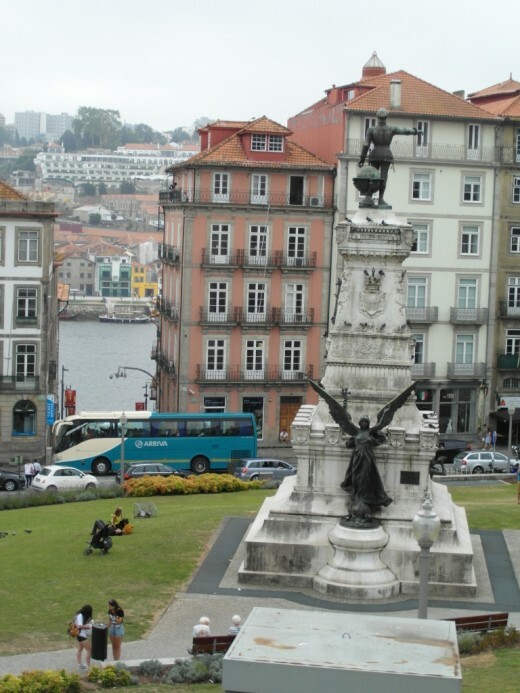 Free shuttle minibusses run from Praca da Liberdade, in Porto and also from Jardim do Morro and Avenida Diego Leite in Vila Nova de Gaia. 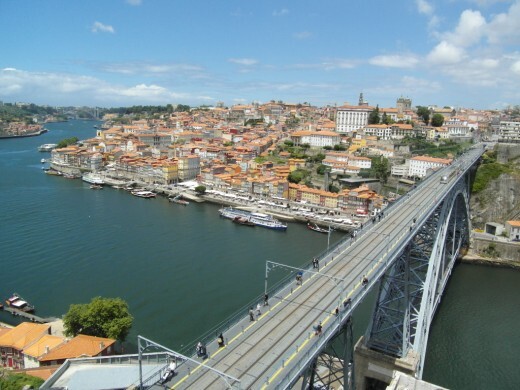 I would recommend hopping on one, as El Corte Ingles 1 Avenida da Republica, 1435 4430-999 Porto is over 2km uphill from the southern end of Ponte Dom Luis 1. Pick up a tourist map and you should find a 2 for the price of 1 voucher for the tourist menu. You are supposed to prove your foreign status with a passport or similar ID card, but we were never asked for ours. The tourist menu cost us 10 euros each and we had a small beer for a euro each. It’s more of a nice restaurant than a cafeteria. There’s outside dining, which, when it’s breezy or wet has a windbreak around it. An even better option, and one which we noticed the first time we went to El Corte Ingles was the midweek lunchtime buffet, at 9.95 euros each, with an additional 1.80 euros for a liter of spring water. It seemed popular with the Portuguese and it's always a good sign if the locals dine somewhere. 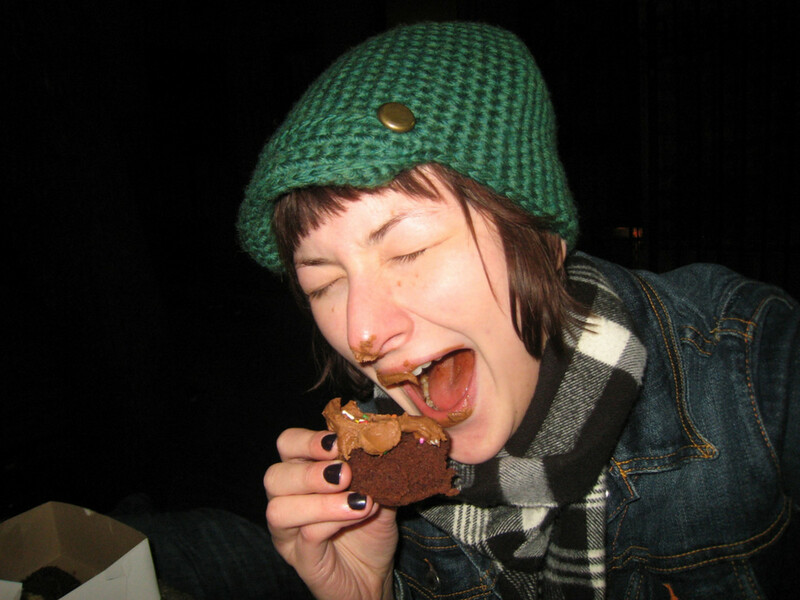 If you have worked up an appetite, this all-you-can-eat approach to dining might suit you better. We just had to go back another time to give it a try and this menu didn’t disappoint. The top bargain eating place we found was on a tip-off from the Tourist Information office in Leca da Palmeira. The man there recommended Brisamar, Rua do Castelo 3, Leca da Palmeira 4450-632. We had a 3-course meal here for 2 people plus wine for a bargain 11.70 euros. Admittedly the choices for the main course were simple (meat/fish) and on the first occasion we weren’t quite sure what meat we were eating, but the fish choice on the second occasion was excellent. There’s a very reasonably priced a la carte menu as well and we couldn’t beat this place on price. There are a limited number of tables outside, but these can get busy or may not be in use if it's windy. Another option is to eat inside with the locals, a sure sign that this is a good value eating place. Another place we tried out was Vagas Bar, Avenida General Norton de Matos, Praia Sao Salvador 4450-208 Matosinhos. Located overlooking the beach with great views towards Castelo Quiejo, the outside terrace is very popular. 2 main course fish dishes cost us 19.80 euros, a bottle of wine was 6 euros and a 1.5-litre bottle of water cost us 2 euros. Not the cheapest of meals, but a great location. It wouldn’t be a holiday without a few breaks for drinks and snacks. Like any other tourist destination, there is no shortage of cafes and bars in Porto and the surrounding area to suit every budget. 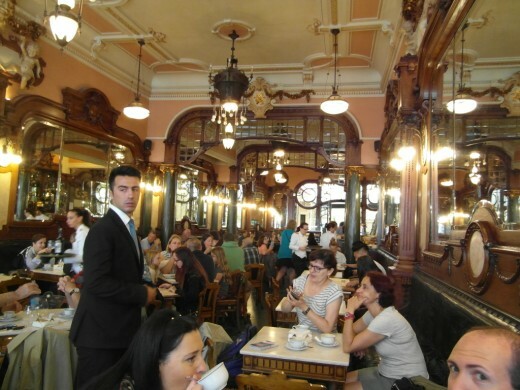 Porto’s best-known tea house is Café Majestic (Rua Santa Catarina, 112 4000-442 PORTO) dating from 1921, with its art nouveau décor reminiscent of a Parisian café. At busy times you might have to queue, such is the popularity of this tourist watering place. It is said that JK Rowling came here to write Harry Potter, whilst she was working in Porto and a number of Portuguese celebrities have signed the guest book. To come here is as much about the experience as the food and drink. This one pushes the budget a little, but there's always room on holiday for the odd treat. A coffee set me back 4.50 euros and an Earl Grey tea cost 5 euros, so by Portuguese standards definitely not the cheapest place for a drink, but well worth it for the setting. We came here on a damp day, by the time we had finished our drinks and taken in the location the weather outside had brightened up and we were ready to set out one more on the tourist trail around Porto. A bar/club is maybe not the obvious place for a middle-aged couple to stop for a drink. But the Hard Club (Praca Infante Dom Henrique, Porto 4050-295) located in a renovated former market and overlooking the same square as the Bolsa, suited us well. By day there’s a terrace overlooking the square with views down towards the river, and we found it a handy place to wait for a timed tour of the Bolsa. To be fair, a tea and coffee here at 3.50 euros for both is not the cheapest you can get, but the location makes up for it and it still represents reasonable value, with its central location near a top Porto tourist spot. 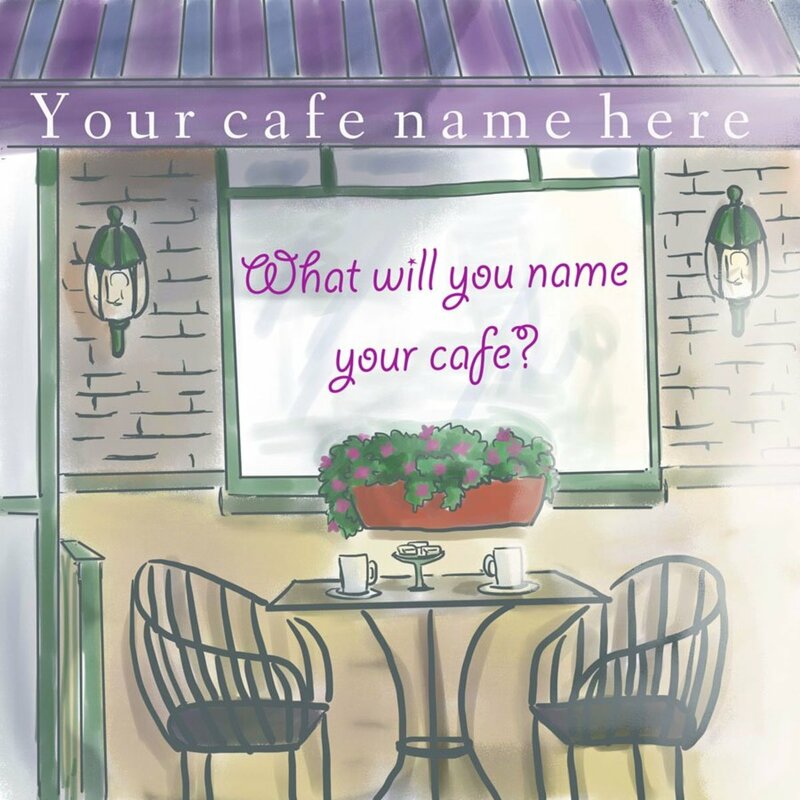 If you tire of city life, the nearby coast offers a wide choice of cafes and bars at a reasonable cost. Set back from the beach, we found two Super Bock (locally brewed) beers at Bista Mar (Avenida da Republica 44 R/C, Matosinhos 4450-237) cost us 2.80 euros. The Portuguese have a way of serving ice cold beer in branded, distinctly shaped glasses that can tempt even the least inclined beer drinker ( like myself) on a warm day. Super Bock has been brewed in Porto since 1927 and has a 40% market share in Portugal. For those interested in discovering more, there's a visitor center at the brewery in Porto. Already mentioned for its food, Vagas Bar, with the great views from its terrace over the beach is a very pleasant place to stop for a drink. A coffee here cost 1.70 euros and a beer the same amount. On a sunny day, this is a highly recommended location. Beware of the wind though. We were once here when a strong gust caught a large umbrella, pulled it from its base and dropped it. Fortunately nobody was hurt, but it gave the management a fright. You might be forgiven for thinking that Sangria is only available in Spain, but the Portuguese are happy to serve their own version of the red wine and fruit mix. Walking west along Avenida de Diogo Leite, on the south bank of the River Douro beyond the restaurants, we came upon a small bar selling jugs of reasonable quality Sangria for 3-6 euros (depending on the size). After a long walk, I think the weary tourist has earned a seat looking out over the Douro with a cool drink of Sangria. On another occasion, walking from the Palacio de Cristal into the center of Porto we chanced upon a very quiet shopping center, where we found a cafeteria selling reasonably-priced meals. Two large glasses of Sangria cost us 3.20 euros. As we were staying in a hotel, which provided a good breakfast, we tended to be on the look out for drinks or main meals, but a visit to Porto would not be complete without sampling Francesinha, a local specialty. Translated as little Frenchie, this is a cheese and egg-topped roasted-meat sandwich in a sauce, usually served with French fries and accompanied by a drink of beer. We found ours at a Tropical Burger outlet near the top of Rua das Flores, within a short distance of Sao Bente train station. Two Francesinhas cost us 13.90 euros and two beers an extra 2 euros. It was a very filling and tasty snack and I would highly recommend it..
No article on food and drink in Porto would be complete without mention of the product for which it is renowned around the world. Port, or Vinho do Porto, as it has been called since the late 1600s, is a fortified wine produced from grapes grown in the Douro valley. 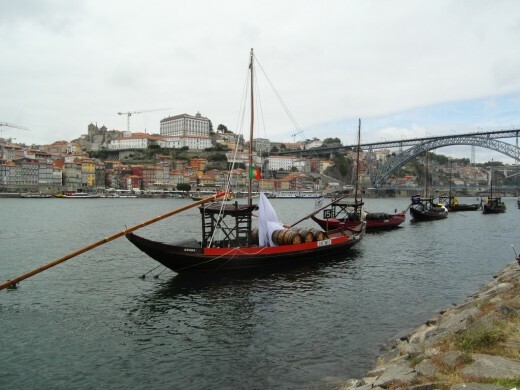 Traditionally the port was transported in large barrels by boat down river to the port houses in Porto. These flat bottomed boats (barcos rabelos) still line each side of the River Douro near Ponte Dom Luis 1, but are now purely for decoration, as they have been replaced by tanker trucks. The variety of port known by many is a sweet red dessert wine, but there are also dry, semi-dry and white versions available. Prices vary depending on how much you are prepared to pay. Typically you can pay as little as a few euros for a supermarket branded variety, which is perfectly drinkable, to substantially more for a vintage variety from one of the famous port houses, such as Taylor's or Sandeman's. 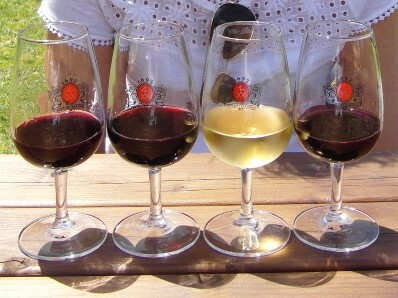 Many port houses offer guided tours and opportunities for port tasting. Budget Tips for Food and Drink Around Porto. Shop around. We rarely stop at the first bar or restaurant we come across. It pays to check out the competition and get a feel for the price range. Be prepared to compromise on location. Cheaper eating and drinking places are sometimes a little further from where the action or the good views are. Check out where the locals go. They are usually reluctant to pay prices hiked up for tourists. If it's a coffee you want, try the local supermarket. 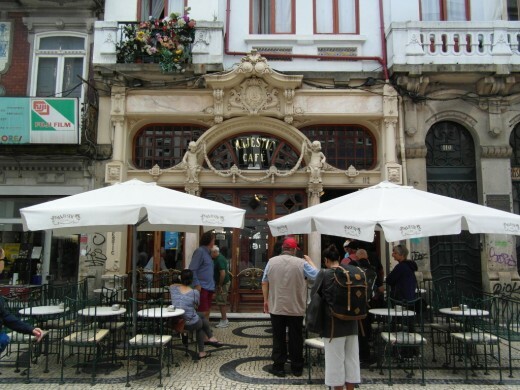 Many in Portugal have a small cafe. They are not the height of luxury, with limited seating, some of which is on high bar stools, but you won't beat their prices or deals. Our favourite is Pingu Doce. Buy your own. While you are in the supermarket take the chance to stock up on water (buy a big bottle to refill your smaller ones), cans of beer (much cheaper than from a bar) and bottles of wine and port (to take home or drink back in your hotel room). Be prepared to raise the budget a little for a special treat. 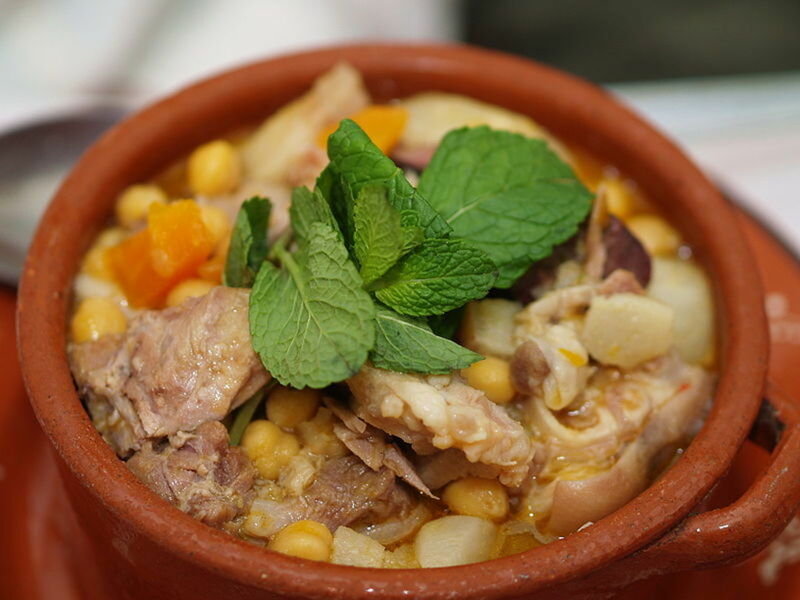 Be open-minded and be prepared to try local specialities. Thanks for your comment, Linda. In the past I have sometimes got frustrated searching round places for somewhere reasonable to eat, especially when time is limited. We were fortunate to have time to spare in Porto, so I thought it would be helpful for others to share our experiences. Cafe Majestic featured in the guide books and was worth going to just for the experience. Great suggestions for food and drink in Porto. The photos and tips are great for a visit to the city. I think I would have to go to Cafe Majestic for sure. It looks amazing! Thank you for your comment, Filma. I would rather have several budget holidays and see a lot of different places than spend out on one extravagant trip. Eating out on a budget can be a challenge so it's helpful to share tips. I hope you get to Porto one day. We find Portugal to be one of the cheaper European countries to visit. Love this article! We are budget travelers like you and it's interesting to find tips on where to eat. This is one of the dream places in our bucket list. Beautiful photos, too. Thanks so much! Thank you for your comment, Patricia. I hope that one day you get to Portugal. Porto is worth a visit. I have yet to get to the USA. The Atlantic between us makes for expensive travel. Thank you for your comment, Kirti dv. The longer you stay somewhere the more time you have to find a good range of eating places. 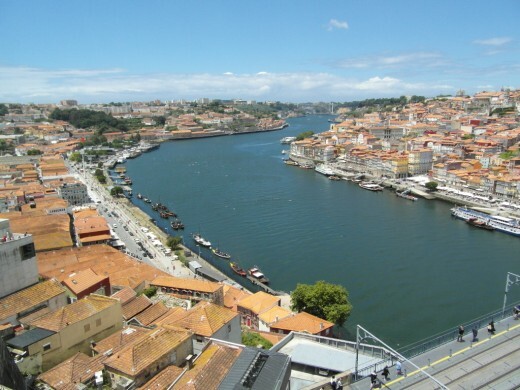 I think Porto is slightly cheaper than other places because it is not yet a top tourist destination. Although it is definitely increasing in popularity. Amazing Liz. Many choices to dine and snack. That's my kind of place. Thanks, Robert. I appreciate your comment. I find writing about my experiences helps me to relive my travels. This article gives great details on where to eat and the prices. Great travelogue. I hope that one day you might experience it for yourself, Tom, without being kidnapped. Who knows? Maybe with the developments in virtual reality, we'll all be travelling from our armchairs in the future. Although I think we have a while to go before they can fully replicate the restaurant experience! Now if some hoodlums kidnap me and dump me unawares in Portugal, I'll know exactly where to eat for cheap. Thank you! Of course, being a fat man is the best defense against kidnapping, so it's exceedingly unlikely that it will happen. Still, one can hope. Thank you, Linda. I appreciate your positive comments. Thanks for your kind comments, Peg. I'm pleased that I've found an avenue for using my photos. I take so many! Liz, lovely photos of the food and the place you visited. What a very detailed article you got here about where to eat and drink for good value. Portugal looks very beautiful indeed from the lovely photos. Well done. This looks like a gorgeous place to visit to try out the local food. The photos really enhanced the description of the restaurants and the area. Thanks for the comment, Coolmon2009. We enjoyed going there and I hope our experience can help others. 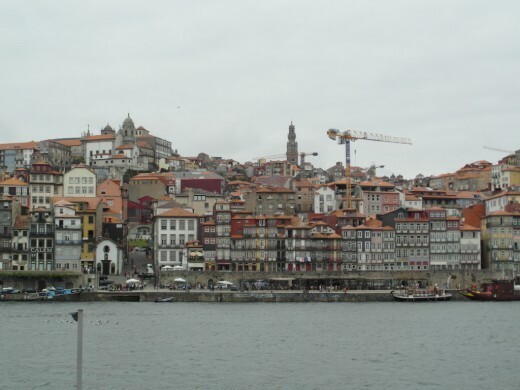 Thanks for this information on dining in Porto; Good article if planning a trip there. Thank you, Dora. Having had four children, we've been in the habit of making our budget go as far as possible on holiday. 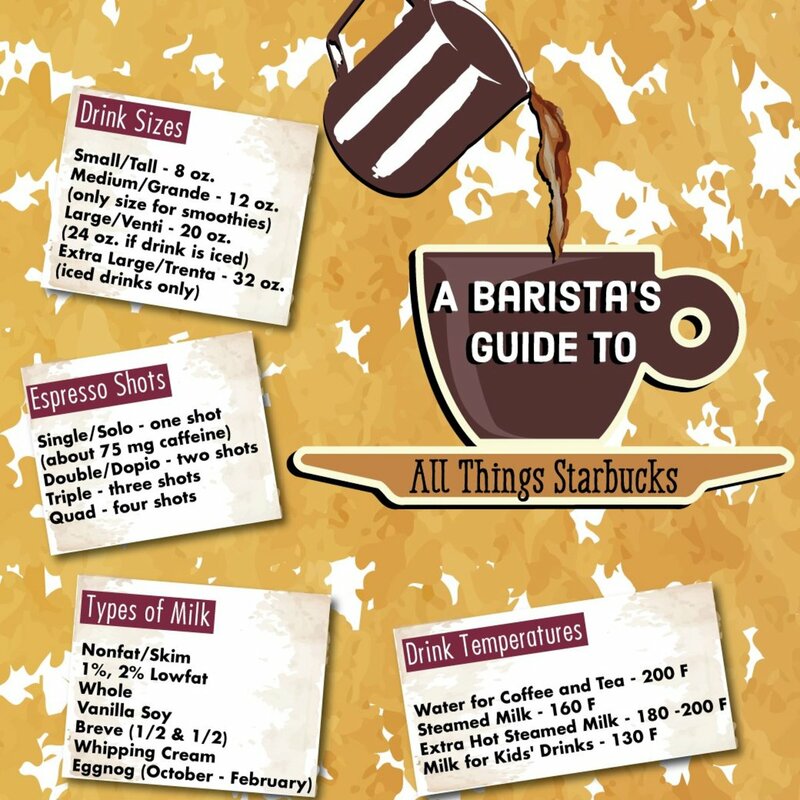 Very good food guide complete with helpful suggestions. Thanks especially for the budget tips; this can save the tourist from running out of money for food. Carrefour is one I remember, as well as Auchan. That must have been a great experience to go to school in Grenoble. I blame the availability of alcohol at such cheap prices in France for getting me into the habit of having a glass of wine with a meal. Whenever we take the car over to the continent we make sure to stock up at Carrefour or Auchan in Calais on the way home. After Brexit, this will all change, as I'm guessing that the customs tariffs of my youth will return, limiting how much we can bring back to the UK from France. It’s changed a bit today because you can now purchase beer and certain wine products at designated grocery stores within the Commonwealth like Pittsburgh-based Giant Eagle. As for vodka, gin, rum, etc., you still have to go to a special liquor store that is moderated by the Commonwealth of Pennsylvania. Thank you for your comment, Gregory. French hypermarkets have cafeterias that can offer some good meals at reasonable prices. A friend once traveled to Rome and passed on the advice to eat where the locals go, after her experience there. I think it holds true for a lot of tourist destinations. Liz, thanks for a great article. 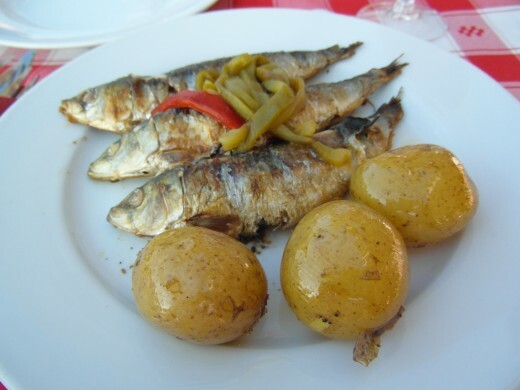 I especially liked your meal of sardines and potatoes at Restaurante Beira Rio. (The photo is great too.) It’s interesting too that local supermarkets in Portugal have cafes. Some grocery stores in Pittsburgh have them too, notably the Giant Eagle store where I shop sometimes. You were wise in going to places that the locals frequent. Oh yes, your article is really packed with detail. Thanks for your comment, Peggy. I prefer sardines like this, rather than out of a can. The first ones I tried were in Spain, on the Costa del Sol, where they grill them on barbecues by the beach. We took some friends to Barcelona a few years ago. He loved his sardines from a can, but he was bowled over when we found some grilled sardines for him in a restaurant there. I don't recall seeing many street vendors if any on our visit, Janisa. I guess I tend to avoid them, as I'm wary of hygiene issues and risks associated with them. Although I do recall sampling an almond drink, horchata, in Valencia from a street vendor and also churros in Tarragona, Spain. Generally, I prefer to eat from a cafe or restaurant. If we ever plan a trip to Porto I will definitely put this information to good use. Loved seeing your photos. The photo of the sardines reminded me of the first time we had ever eaten them like that (not out of a can) when we were in Madrid. They were wonderful! Thanks for all of your tips. And what about street vendors in Porto? Are they common or nonexistent? I'm trying to remember my trip to Lisbon, but can't recall this detail. One of my favourite ways to try local cuisine affordably is by buying from people selling on the street, although I'm quite skeptical about it sometimes. Thanks for your comment, Linda. Spain is where I've tended to drink Sangria the most. I've noticed that how it's made varies greatly. Supermarkets stock cartons or large bottles of the red wine mixed with fruit juice variety and I suspect that this is what a lot of bars serve up in jugs topped with fruit pieces. I have also seen it prepared in hotels with various spirits in the mix, making it a lot more potent. In recent years I've noticed a lot more white Sangria, made with white wine. We have also picked up plastic bottles of Sangria in French supermarkets. Thank you for your comment, Mary. Unfortunately, our visit to Afurada coincided with village celebrations and eating places were either packed out with locals or stopped serving early in preparation for the upcoming parade. You are right, occasionally it has been good to spend what we have saved and enjoy a really memorable but not so cheap meal. The only time I've ever drunk sangria was on a trip to Spain. It's interesting to hear that the drink is popular in Portugal as well. This article and your other ones about Porto are great guides for someone who plans to visit the area. You've included a lot of useful information in them. You reminded me of our wonderful stay in Porto. The food is great but the best meal we had was in Afurada, just a short boat ride from Porto. It is still a fishing village. You are right about supermarkets. 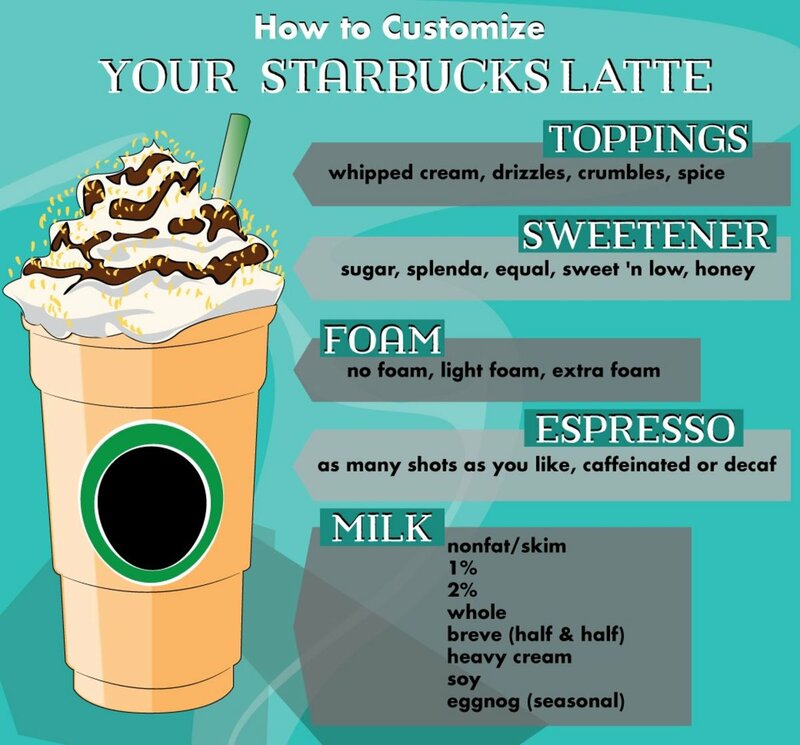 We often use these in our travels and save some money to enjoy in the best restaurants. Thanks for your comment, FlourishAnyway. I hope your trip to Peru goes well. I'm always slightly wary about eating out, as I'm never quite sure what the hygiene standards are like in a restaurant kitchen. I steer clear of mussels, prawns etc after a bad seafood paella experience in Spain a few years ago. Some say to avoid salads, especially in hot countries, because you don't know what water it was washed in and there's a risk from bacteria. I tend to just follow my instinct (and my husband's advice!). I’m such a picky eater that when I travel it’s always a challenge. I’m going to Peru this summer and am very nervous about what to eat because I’ve been thoroughly warned by medical professionals about precautions to take. Your trip, however, sounds delightful because you have an adventurous spirit gastronomically and it looks like there was much to choose from.